Spruce up your front or backyard in a jiffy by planting one of these sets of fast-growing evergreens. Q: We just bought a house in a brand new development so our yard is pretty bare. We’d like to plant some fast-growing evergreen trees for year-round color as well as privacy. Which evergreens will give us quick cover and also boost our curb appeal? A: Trees and shrubs that retain their foliage year-round are great for adding a natural design element to your yard and serve as focal point in your landscape. And, as you’re well aware, the staying power of their leaves or needles also helps to create a dense, beautiful barrier between houses and shield your home from the street. The following fast-growing evergreen trees could transform your yard from sparse to spectacular in record time! But, since not all species thrive in all regions of the country, be sure to consult the United States Department of Agriculture’s Plant Hardiness Zone map to help determine which of the seven picks would do best in your neck of the woods. 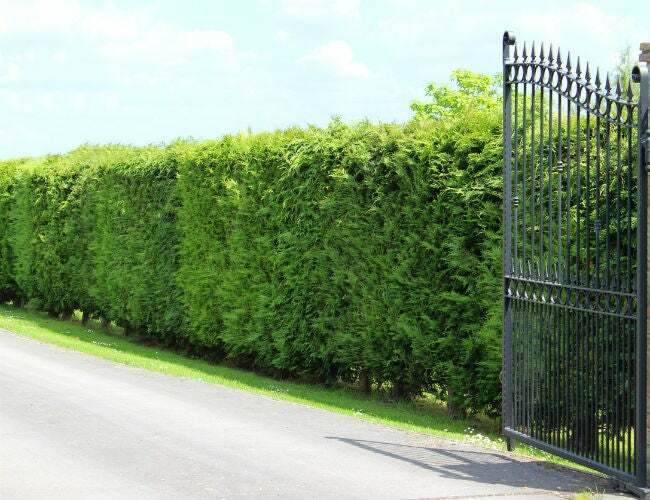 Gain optimal privacy with the Thuja Green Giant. This evergreen (T. plicata x T. standishii) grows up to 3 feet per year, topping out at 35 to 40 feet high with a base spread of 12 to 15 feet. Its heavy branches and textured, supple green foliage lend a soft natural look to the landscape, and once established, Thuja Green Giant is drought tolerant and resists insect infestations. It thrives in virtually all soil types, even heavy clay, and grows best in full sun to partial shade in zones 5 through 9. For a privacy fence, plant small trees 6 feet apart that will quickly grow to form a compact hedge. Thuja Green Giant is strong enough to use as a windscreen in rural areas and will withstand heavy ice without branch breakage. Give plenty of sun to the popular Leyland Cypress. With its soft feathery texture, rich bluish-green color, and growth rate of 3 to 4 feet per year, it’s no wonder the Leyland Cypress (x Cupressocyparis leylandii) is a garden center bestseller. This hybrid cypress can reach a mature height of 70 feet, and if planted as a single specimen tree will develop a base spread of 20 feet at maturity. For a dense privacy screen, plant small nursery trees 8 feet apart. Leyland Cypress prefers a location where it will get 6 hours or more of direct sunlight per day. It’s not fussy otherwise, tolerating most types of soil, including sandy and heavy clay, and once established, it’s drought tolerant, actually preferring slightly dry soil (faring well in zones 6 through 10). 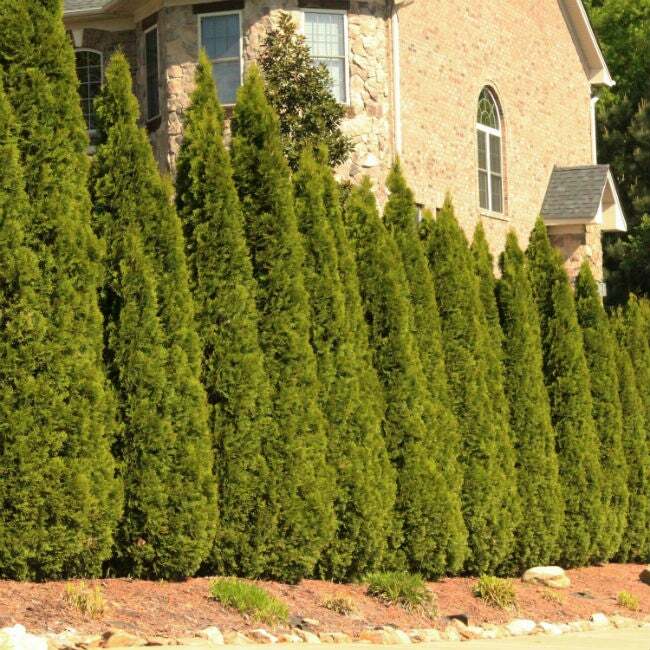 If a formal hedge is desired, Leyland Cypress can be pruned annually without damage to the tree. Strike a stunning contrast with Nellie Stevens Holly. 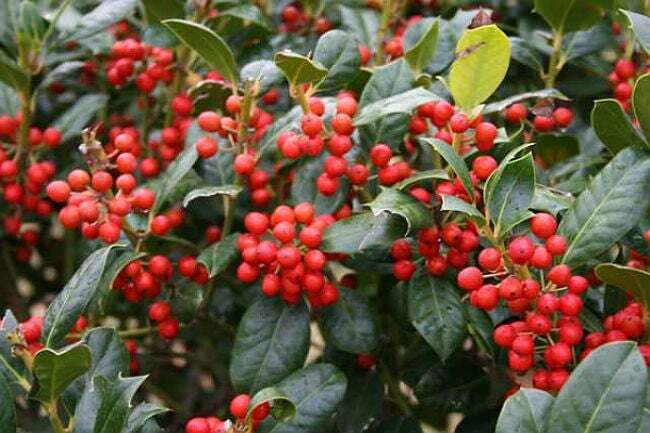 A pyramidal shrub that reaches a mature height of 25 feet, the Nellie Stevens Holly (Ilex x ‘Nellie R. Stevens’) is a broadleaf evergreen that grows 2 to 3 feet per year and can be easily trimmed to maintain a formal box hedge. Its deep-green, glossy year-round foliage develops vivid red berries in late fall that provide striking contrast and attract overwintering birds and wildlife. For a privacy screen, plant Nellie Stevens Holly 5 to 6 feet apart; it will quickly fill in to form a natural fence prickly enough to deter unwanted visitors. This holly grows the fastest in slightly acidic, well-drained soil, in a location getting a minimum of 6 hours of direct sunlight daily. Nellie Stevens is a vigorous grower in zones 7 through 9, but will also grow in zone 6, at a slightly slower rate of 1 to 2 feet per year. Plant Italian Cypress in a small yard. 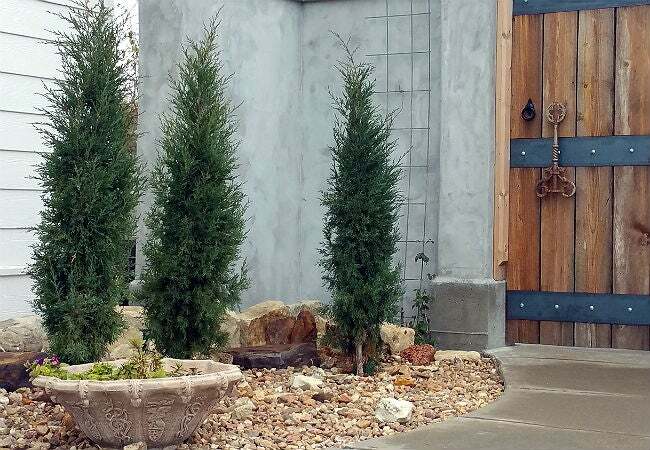 For a slender, elegant addition to your landscape that can grow as much as 3 feet per year, consider Italian Cypress (Cupressus sempervirens). This tall columnar tree can reach a mature height of 40 to 60 feet, but unlike some evergreens, it won’t spread substantially at the base. It reaches a width of only 4 to 5 feet at maturity, making it a good choice for small yards. Italian Cypress is often selected as a standout specimen tree, or used as an accent to flank entrances; it also makes a stunning narrow border between houses. 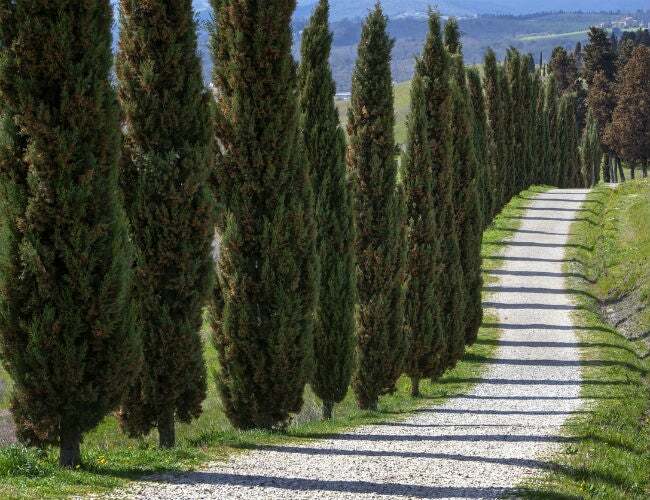 Italian Cypress retains its bluish-green hue all year long and never needs trimming to maintain its columnar shape. While it grows well in most soils and is drought resistant, unlike evergreens that thrive in northern climes, it does best in warmer zones, 7B through 11. Add Taylor Juniper in colder climes. If you fancy a tall columnar tree but live too far north to grow Italian Cypress, the Taylor Juniper (Juniperus virginiana) is a smart choice. This hybrid juniper, discovered in Taylor, Nebraska, is as cold-hardy as other junipers, thriving in zones 3 through 9, and reaches a statuesque vertical height of up to 30 feet. With a base spread of only 3 to 5 feet, it perfectly suits small areas where quick growth (as much as 3 feet per year) is desired. Because it grows upward without leaning outward, it’s ideal for foundation planting. Or planted 3 feet apart, it will form a tall narrow privacy screen. The Taylor Juniper, with its semi-soft, bluish-green foliage, likes full sun, tolerates drought, and thrives in most soil types. Make it quick with the Murray Cypress. 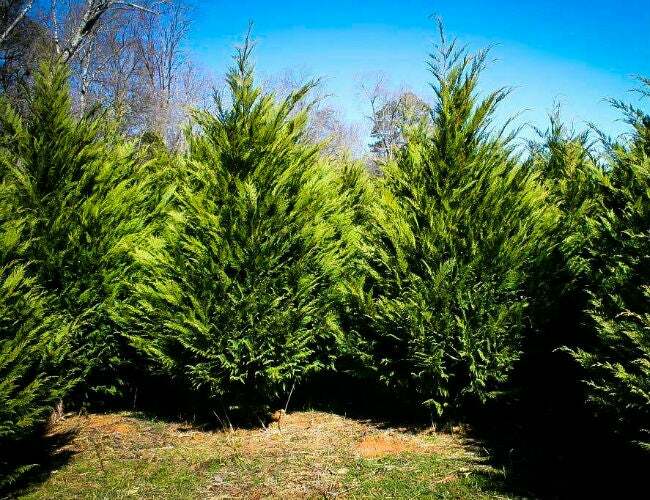 One of the fastest-growing evergreen trees, the Murray Cypress (Cupressocyparis x leylandi ‘Murray’) can spurt up to 4 feet in a single year until it reaches a mature height of 30 to 40 feet and a base width of 10 feet. 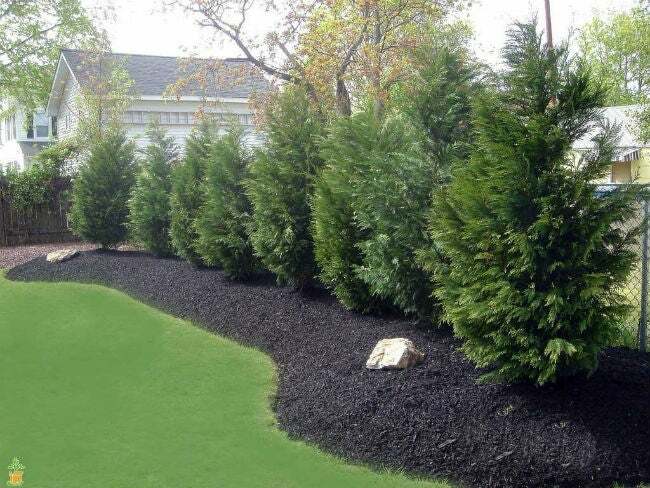 Planted 5 feet apart, these fast-growing evergreen trees will quickly form a privacy fence even more quickly than its relative the Leyland Cypress. A very hardy tree that grows well in zones 6 through 10, this cypress takes harsh winter winds and scorching summer heat in stride, offering shade and medium-green color all year long. Plus, the low-maintenance Murray Cypress thrives in poor soils. It can be left to grow naturally, which results in a slightly shaggy look, or its foliage can be trimmed for more formal appeal. Get a different look with Golden Bamboo. 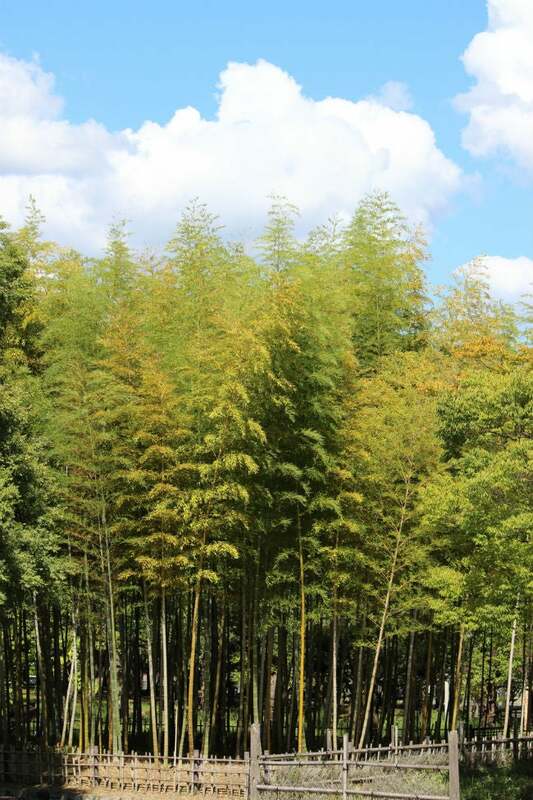 If you’ve got a more exotic evergreen in mind, Golden Bamboo (Phyllostachys aurea) may fit the bill. Technically neither tree nor shrub, it’s a member of the grass family that originated in China, although it’s now widely grown in the United States. Perfect for Asian-themed landscapes, it features stiff vertical golden-colored stems and deep green foliage that will form a lush living wall 10 to 12 feet high in just two years. Golden Bamboo prefers well-drained, moist soil, and full to partial sunlight in zones 7 through 11. It can withstand extreme heat but requires weekly watering during hot summers. For a quick privacy fence, plant Golden Bamboo 2 feet apart, but bear in mind that its roots spread rapidly: To rein it in, plant in a bed with an underground border that extends 8 inches below the surface of the ground.